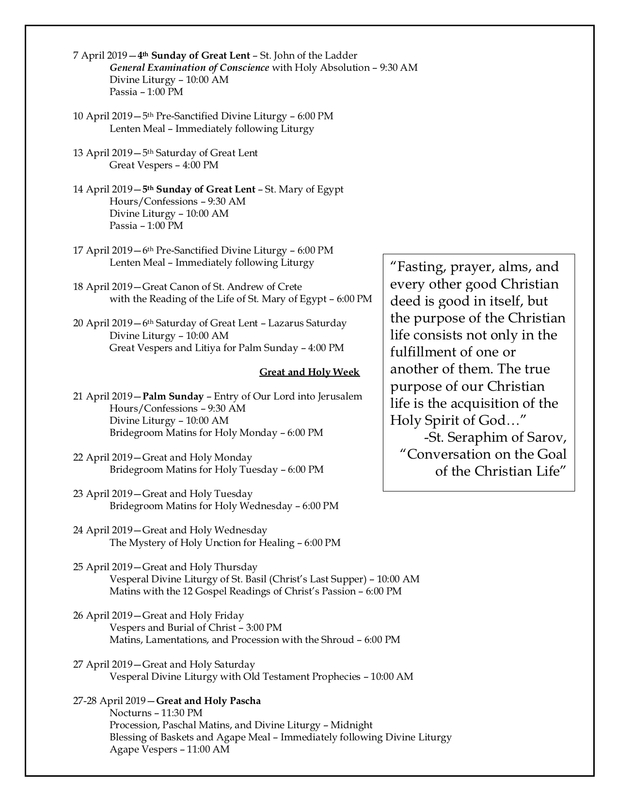 Friends - Join us this Great Lent as we seek to grow in union with God and love together as a parish family. 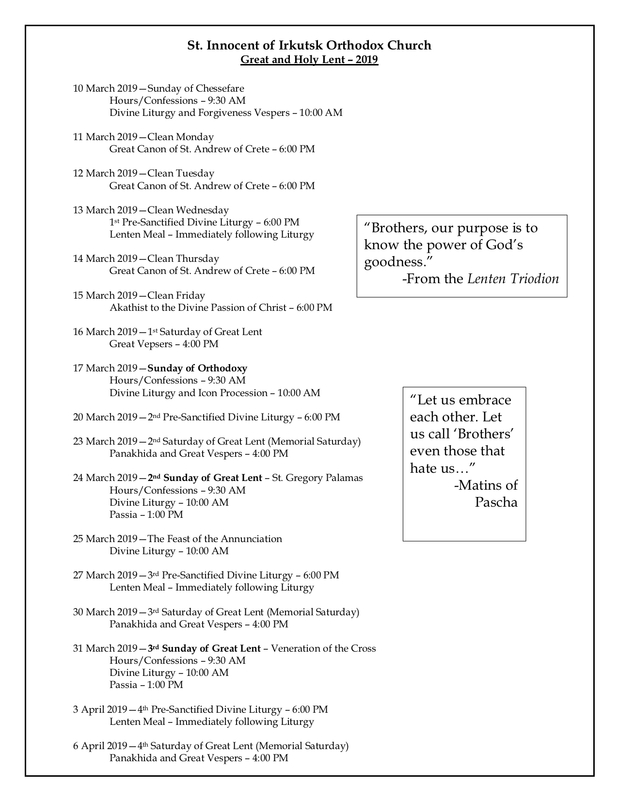 You'll see that we offer the full range of liturgical services, including Pre-Sanctified Divine Liturgies each Wednesday and the Great Canon of St. Andrew of Crete during Clean Week. New this year will be the Passion Services (ЧННЬ ПАССЙИ) at 1 pm on the 2nd, 3rd, 4th, and 5th Sundays of Great Lent. We are deeply committed to being obedient to Christ within a world that is dying to live! We are a small, new-calendar ("revised Julian") parish under the Moscow Patriarchate. Our parish is located in Redford Township at 23300 W. Chicago (Redford, MI 48239), just East of Telegraph. The parish was established in 1967 as an English-speaking parish, named in honor of St. Innocent, the first Bishop of Irkutsk (an Eastern Siberian city). Today, the parish is comprised of Americans of diverse ethnic and racial backgrounds, including numerous converts. The services are celebrated according to the Russian musical and liturgical traditions and are almost entirely in English. We joyfully celebrated our 50th anniversary in 2017! Our children worship with us. If you have young children, they are welcome here, too. If you need to step out for a minute for any reason, you are not disturbing us. We expect children to be raised in the Church and to accomplish that, they have to be IN THE CHURCH. If you are an Orthodox Christian, and you have prepared yourself to receive Holy Communion according to your Spiritual Father’s direction, be sure to introduce yourself to a priest before the service. Once you have informed the priest of your status, you are welcome to approach the chalice. We are part of the worldwide Orthodox Church – the oldest Christian Church in the world. We welcome you to pray with us and grow with us, by the power of God's infinite mercy and love. You are warmly invited to "come and see." Homily by Fr. Joshua, based upon John 1:43-51. Homily by Fr. Joshua, based upon Matthew 6:14-21. Homily by Fr. Joshua, based upon Matthew 25:31-46. Homily by Fr. Joshua, based upon Luke 15:11-32. Week #6, taught by Fr. Joshua. A homily by Fr. Joshua, based upon Matthew 15:21-28. Homily by Fr. Joshua, based upon Luke 18:10-14. A homily by Fr. Joshua, based upon St. Matthew 1:1-25. A homily by Fr. Joshua for Christmas Eve. A homily by Fr. Joshua, based upon St. Matthew 2:1-20. A homily by Fr. Joshua, based upon Luke 14:16-24. A homily by Fr. Joshua, based upon Luke 17:12-19. A homily by Fr. Joshua, based upon Luke 18:18-26. A homily by Fr. Joshua, based upon Luke 13:10-17. A homily by Fr. Joshua, based upon Luke 12:16-21. A homily by Fr. Joshua, based upon Luke 10:25-37. A homily by Fr. Joshua, based upon Luke 8:41-56. A homily by Fr. Joshua, based upon Luke 8:26-39. A homily by Fr. Joshua, based upon Luke 16:19-31. A homily by Fr. Joshua, based upon Luke 8:5-15. A homily by Fr. Joshua, based upon Luke 7:11-16. A homily by Fr. Joshua, based upon Luke 6:31-36. A Homily by Fr. Joshua, based upon Matthew 22:1-14. A Homily by Fr. Joshua, based upon Matthew 22:35-46. A Homily by Fr. Joshua, based upon Matthew 25:14-30.